Horace started ringing at Diptford in 1938, aged 9 years, and in those early days needed a mound of hassocks, four deep, to be able to reach the rope. Ringing came quite naturally to him and what he lacked in height he made up for in determination and enthusiasm, becoming a regular member of the Diptford tower for more than ten years. 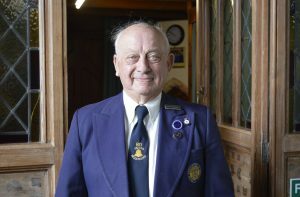 Marriage to Eileen took him to Stoke Gabriel in 1949, where he has rung ever since, progressing to Vice Captain of Tower and then to Captain in 1976 – a role he held until 1994. He continues to ring for all services and special events. He participated in numerous competitions with the Stoke Gabriel ringers with increasing success, was involved in setting up the Totnes Deanery Winter League. In 2001 he was honoured to be elected as President of the Devon Association of Ringers. Throughout this long career of ringing, Horace has been loyally supported by Eileen. plus innumerable local family weddings and funerals and an estimated 7000 weekly Church Services. Horace was interviewed by Radio Devon and BBC TV and these were broadcast on 10 June 2018 on the day a sung eucharist was held to celebrate Horace’s 80 years of ringing. A presentation was made to Horace, by the church, following the service.